About this Doggy Bag Dispenser: This bone shaped poop bag dispenser includes 15 eco-friendly disposable bags packed inside.This doggie bag dispenser also features a clip to hook on to any leash, belt loop or purse.Customize these waste bag dispensers with an imprint to promote pet care stores, animal shelters, veterinary clinics, dog shows and more! NOTE: Product comes with Prop 65 warning label when shipped to California. Label reads: "WARNING: This product may contain carcinogen, which is known to the State of California to cause cancer. For more information, go to www.P65Warnings.ca.gov. About this Doggy Bag Dispenser: This fire hydrant shaped poop bag dispenser includes 15 disposable bags packed inside. 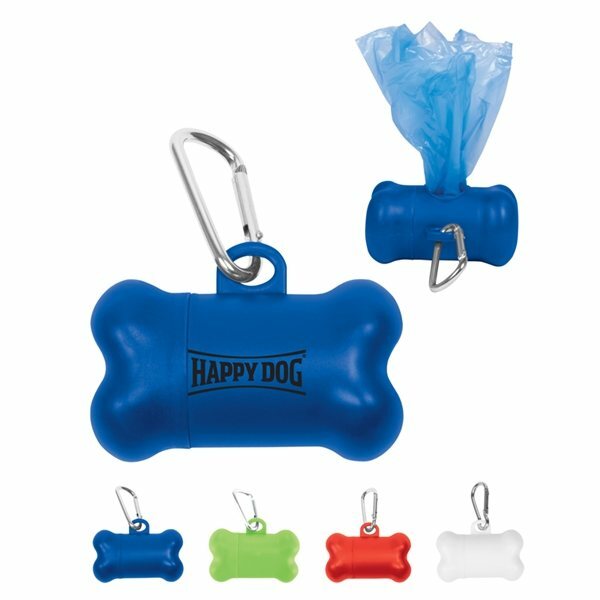 This doggie bag dispenser also features a clip to hook on to any leash, belt loop or purse. Customize these pet waste bag dispensers with an imprint of your company name and logo and promote pet care stores, animal shelters, veterinary clinics, fire departments, dog shows and more! NOTE: Product comes with Prop 65 warning label when shipped to California. Label reads: "WARNING: This product may contain carcinogen, which is known to the State of California to cause cancer. For more information, go to www.P65Warnings.ca.gov. About this Collapsible Pet Bowl:This collapsible water bowl with caribiner is perfect for traveling, long walks or the dog park with your pet Just pour water into the bowl for a quick drink to keep them hydratedAttached carabinerEasy to clean linerMateral: 600D PolyesterSpecial Instructions:Rush Service:The standard imprint method, 1-color/ 1-location is available. About this Dog Bag Dispenser With Flashlight:Extra Bright White LED Light.Twist Action Turns On/Off.Refillable Barrel Holds 25 Disposable Bags.Attaches To Leash, Belt Loop, Etc.Button Cell Batteries Included.Special Instructions:Rush Service:Catalog Quantities Only.One Color And One Location. About this Pet Waste Disposal Bag Dispenser w / Flashlight:Disposable pet waste bag dispenser with built-in flashlight. Case made of polypropylene plastic and features storage compartment filled with approx. 25 black disposable PE plastic starter bags for the careful pet owner. Refills not available for purchase, however case unscrews to refill with extra plastic shopping bags from around the home or your local pet supply store (note: we cannot guarantee the number or size that will fit). Disposable bags measure approx.10"W x 11 1/2"H each. Twist on/off to activate LED light. Uses 3 button cell batteries (included and replaceable). Plastic carabiner clip at end for attaching to bags or belt loops.WARNING: To avoid danger of suffocation, keep this plastic bag away from babies and children.Do not use this bag in cribs, beds, carriages or play pens. About this Collapsible Travel Pet Bowl:Collapsible folding 600D Polyester bowl for feeding your pet on the go.Bowl comes folded in half with velcro tab closure and includes PP plastic clip – great for attaching to belt loops or leash.Holds approx. 16 oz of water or pet food.Ideal for a day in the park, camping, or just going for a walk. About this Diaper Pet Waste Disposal Bag Dispenser:Disposable diaper and pet waste bag dispenser with plastic clip attached to lid that can be clipped onto diaper bags, purses, leashes, and belt loops.Case made of polypropylene plastic and features storage compartment filled with approx. 20 disposable clear frosted PE starter bags for for mom's on the go and careful pet owners.Refills not available for purchase, however case unscrews to refill with extra plastic shopping bags from around the home or your local pet supply store (note: we cannot guarantee the number or size that will fit).Disposable bags measure approx.10" x 12" each.WARNING: To avoid danger of suffocation, keep this plastic bag away from babies and children. Do not use this bag in cribs, beds, carriages or play pens. About this Pet Rope Tug Flyer Toy:Fun dog toy that will have everyone joining in the fun.Duo flyer and rope toy made of cotton rope w/ polyester center/imprint panel.Great for playing rope tug or fetch.Latex-free.Machine washable; however we recommend hand washing all imprinted products. About this Pet Litter Scoop:Paw shaped scoop Long handle is perfect for cleaning the cat box.Special Instructions:Rush service: 1-color/1-position required. Item color assortments are not available. About this Pet Food ScoopN Clip:Easily dig out pet food with this large paw shaped scoop Tightly seals pet food bags Features 1 cup size to help manage portions.Special Instructions:Rush service: 1-color/1-position required. Item color assortments are not available. About this Small Scoop - It Bowl:Smart combo scoop and bowl Small bowl is ideal size for cats and small dogs 10 oz. capacity.Special Instructions:Rush service: 1-color/1-position required. Item color assortments are not available. About this Ultimate Doggie Bag:Dog Bones treats in a mug stuffer bag.Cookie and snack treats for the unconditional love our dogs give us.Special Instructions:Blank items not available. About this Medium Scoop - It Bowl:Smart combo scoop and bowl Medium bowl is ideal size larger dogs 15 oz. capacity.Special Instructions:Rush service: 1-color/1-position required. Item color assortments are not available. About this Caribiner 2 Bag Dispenser:Features a refillable compartment with 20 biodegradable disposable bags (sized 8 3/4" W x 12 1/2" H) Fits most store purchased bag refills Easily attaches to a leash or belt loop with carabiner.Special Instructions:Rush service: 1-color/1-position required. Item color assortments are not available. About this Doggie Bag:Dog Bones treats in a clear header bag.Cookie and snack treats for the unconditional love our dogs give us.Ingredients on back label.Special Instructions:Blank items not available. About this Perky Pet Travel Bowl:Folds compact with hook & loop closure for easy storage Clip easily attaches to a leash, backpack or belt buckle 600D polyester construction holds up to 24 oz. of dry food only.Special Instructions:Rush service: 1-color/1-position required. Item color assortments are not available. About this H2Ogo Pet Bowl:Collapsible pet bowl for the on-the-go pet lifestyle. 3 cup, 24 oz. capacity. Includes aluminum carabiner. Easy to carry with large imprint on side panel will ensure your brand is visible with every step. Snaps in closed position around leash or clipped to pack for easy transportation. Sealed PVC construction will ensure leak-free use. FDA approved material.Special Instructions:Rush service: 1-color/1-position required. Item color assortments are not available. About this Waste Bag Dispenser:Our delightful dog bone designed bag dispensers make pet clean up easy. The plastic dispenser in your choice of 3 colors comes with a supply of bags for handy accessible clean up on walks or in your yard.This product is spot-printed. Each color printed will typically have up to 1/4" of drift. Designs with different colors too close together may result in the colors misregistering (overlapping with each other). About this Bird Feeder:Feeder is made of polypropylene and uses a 2 liter bottle (not included) filled with bird seed. A great re-use of plastic.Special Instructions:24 Hour Order :One color/one location imprint only.All additional charges, such as setup and PMS matches apply.No special packaging available on 24 hour service.24 hour orders cannot be combined with other promotions. About this Poopy Pet Bag Dispenser:Contructed of 70D Features a refillable compartment with 20 biodegradable disposable bags (sized 8 3/4" W x 12 1/2" H) Plastic clip attaches to any backpack, belt loop or leash. About this Pet Collapsi - Bowl(TM):4" diameter soft flexible silicone bowl 8 oz. capacity Collapses flat for easy storage Carabiner attaches to a leash, belt loop or backpack. About this 7 Pet Collapsi - Bowl(TM):Large collapsible pet bowl measures 7" across the rim to keep the biggest dogs happy. Pet friendly and FDA tested for food and water contact. 32 oz. capacity (944 ml) storage. Carabiner attaches to a leash, belt loop or backpack. About this Dirty Diaper Bag Dispenser:70D nylon construction Includes 20 biodegradable, plastic disposable bags (sized 8 3/4" W x 12 1/2" H) Plastic swivel clip Discrete way to dispose dirty diapers when you are on the go. About this Fido Waste Bag Caddy:Pet waste disposal bag dispener. Lightweight, clips to almost anything. Biodegradable bags included. Refillable and recyclable holder. NOTE: Product comes with Prop 65 warning label. Label reads: "WARNING: This product may contain carcinogen, which is known to the State of California to cause Cancer and Reproductive Harm. For more information, go to www.P65Warnings.ca.gov. About this Big Doggy Bandanna:This pet handkerchief is the perfect dog bandana for medium and large canine pals! 100% Cotton Triangle Bandanna. Great for Outdoor Events and Dog Lovers. Pet Products, Bandanna Material: CottonSpecial Instructions:Rush Service:Rush Service prices are for one color imprint only, standard ink colors. Multicolor imprints, halftones, additional location imprints and PMS matches will require an additional 1-3 working days. About this Lil Doggy Bandanna:This pet handkerchief is the perfect dog bandana for small dogs and puppies! 100% Cotton Triangle Bandanna. Great for Outdoor Events and Dog Lovers. Pet Products, Bandanna Material: CottonSpecial Instructions:Rush Service:Rush Service prices are for one color imprint only, standard ink colors. Multicolor imprints, halftones, additional location imprints and PMS matches will require an additional 1-3 working days. About this 3/4 Smooth Nylon Pet Leash with Bright Metal Snap Hook:Your company won't "slip" up when you select this fantastic marketing tool. Choose this 3/4" Nylon Pet Slip Lead as an excellent giving during fundraising events. Add your logo using the SilkScreen imprint method. What a wonderful opportunity to promote business. Dog training schools and pet walkers would benefit from this product. Enhance your promotional campaign by ordering this product today. About this Pet Treat Bag:Brightly colored 6" x 7" 210D Lined Polyester Tote - Compact and Excellent for trade show giveaways. Comes with Plastic Clasp Clips for Leash or Backpack. Holds Dog Treats & Other Essentials for Your Walk.Special Instructions:Rush Service:Rush Service prices are for one color imprint only, standard ink colors. Multicolor imprints, halftones, additional location imprints and PMS matches will require an additional 1-3 working days. About this Crunch - It Dog Toy:Simply insert an empty water bottle with tight cap. Makes a loud "crunching" noise when dog bites down. Heavy duty ring makes it a real tug-o-war with your dog. About this Fetch - It Dog Toy:Fun for you to throw. Fun for your dog to fetch. About this Pet Toy Tennis Ball:Specially made for pets, this low bounce, fetch tennis ball is a fun way to spend time with your furry friend. Available in 9 vibrant colors, these tennis balls are printed with child and pet safe inks. Perfect for outdoor events, groomers, pet rescues, fundraisers and more. About this Tennis Ball with Thrower:Our tennis ball thrower will not only save your shoulder from pain, but it will have your pup wagging his or her tail with pure joy. Your brand logo and message appear on the handle. Ideal for pet centers, parks, fundraisers and more. Comes in 3 colors. About this Pet Bag Dispenser:Matching metal carabiner attaches easily to a leash or belt for easy on the go use. Includes 15 waste bags to clean up after your furry friend. Twists open for easy refill. Thank you Claudia and Su for your kind reviews. Our promotional pet waste disposal bag dispenser will be a huge hit at pet events. Whether pet adoption events or pet retailers, you’ll miss out if you don’t have these! The pet waste disposal bag dispenser is useful for pet owners to pick up any accidents. Ever walking your dog and have no trash bags? This bag dispenser will help keep your walk clean from any pet accidents. Case made of polypropylene plastic and features storage compartment filled with approx.20 disposable 0.0007mm PE starter bags for the careful pet owner (bag color matches case color). Disposable bags measure approx. 10 5/6"W x 12 5/6"H each. Includes attached silver metal carabiner for use on the go. Do not use this bag in cribs, beds, carriages or play pens. Purchase your Pet Waste Disposal Bag Dispenser now! Thank you Aaliyah and Riley! We’re glad you liked them. Our Bird Feeder is a top seller for pet supplies. Customers could receive this for any event! Our promotional bird feeder will not only catch the attention of new customers, but also birds! This eco-friendly bird feeder will help make a difference to our world. Feeder is made of polypropylene and uses a 2 liter bottle (not included) filled with bird seed. A great re-use of plastic. Purchase your Bird Feeder today! Thank you Jesus and Makayla! 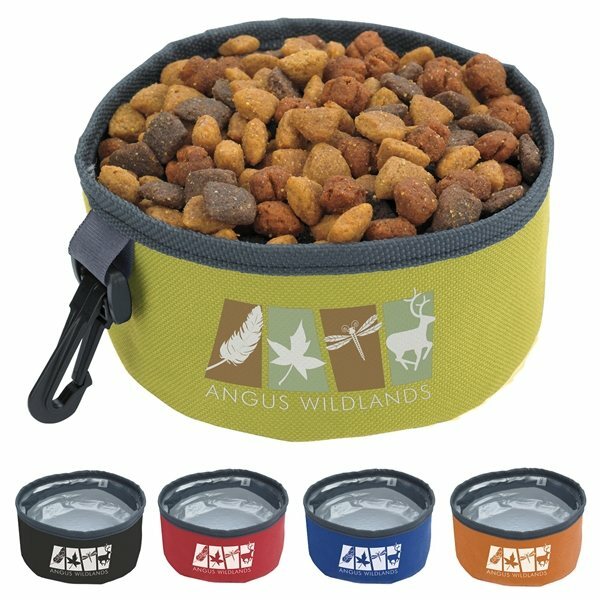 The collapsible bowl is convenient for any pet owner traveling away from home. Take these bowls to go to pack food and water for your pet! This collapsible water bowl with carabiner is perfect for traveling, long walks or the dog park with your pet. Just pour water into the bowl for a quick drink to keep them hydrated. Available in red, royal blue, apple green, black, and orange. Order your Collapsible Pet Bowl here. With over 100+ promotional pet supplies available, you can find the purrfect one! You’ll find supplies for dogs, cats, birds, and more! We have leashes, bowls, feeders, dispenser bags, first aid kits, and so much more! Your pet will love you! Pet supplies are always needed if your customer owns a pet. When walking your dog, you need to consider carrying a portable bowl for water, portable bowl for food, and a bag dispenser for any accidents. On top of this, you’ll already have a leash a collar on your dog! That’s a lot of marketing on one dog. Your customer’s pet will be walking around with their new swagwoof! You can also enjoy looking at all our other promotional items for birds and fishes. We offer bird feeders for all to enjoy. Bird lovers will love this on their porch! Our custom pet supplies are specially priced and professionally imprinted to vividly promote your brand. Search our site for a wide selection of pet products including pet water bottles, training clickers, double pet leashes and more! See for yourself just how high AnyPromo’s standards are when it comes to brand impact. Click through our inventory of promo pet supplies on sale now. Here is a snapshot of our selection of promotional pet supplies currently available. We’re ready to help expedite your order, so give us a call! Pet lovers everywhere will love these great promotional gifts! Pet supplies are good for all pet owners, because customers love to give something to their loyal companions at home! Promotional pet supplies are great for pet retailers, pet trade shows, pet clubs, and more! Provide your customers with items that could help market your company. Our featured list contains a mixture of items for all pets. These promotional pet supplies have been purchased by many customers.